So what technology will prevail in schools? Will the schools invest in tablets, laptops, smartphones or teacher technology such as white boards? It’s often interesting to read how one district, school or even country decides to place all their bets on one platform and we see mass buying. The converse is as often true with many authorities unsure of what will prevail and opting to spread their bets across all platforms. At the end of day it’s often down to cost and budget and who happened to make the best offer. The Telegraph reports on Aberdeen's school authority which is planning on lifting its ban of pupil’s smartphones in some 62 primary and secondary schools. The authority have not only lifted the ban but propose to actively encourage smartphones as a learning tool in schools which will effect some 24,000 pupils. 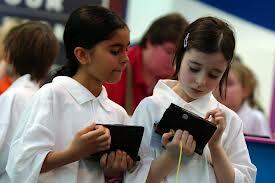 to provide access to a smartphone or tablet for all pupils. They state that access the internet in class unsupervised will be prohibited and filtered and that pupils would also not be allowed to make phone calls. An investment of some £35 a head would appear small but could also have significant implications moving forward. Is the investment a one off and if so, how long before the technology bought requires replacement? If the investment is based on a rental model is it then an annual charge on the budget and does it then compete with other learning resources? Should parents buy their children the best device or align it to the schools, or just let the schools buy them full stop? We are in favour of schools being technology enabled and all pupils being given access but find ourselves asking that old question of which came first the technology chicken or the content egg?